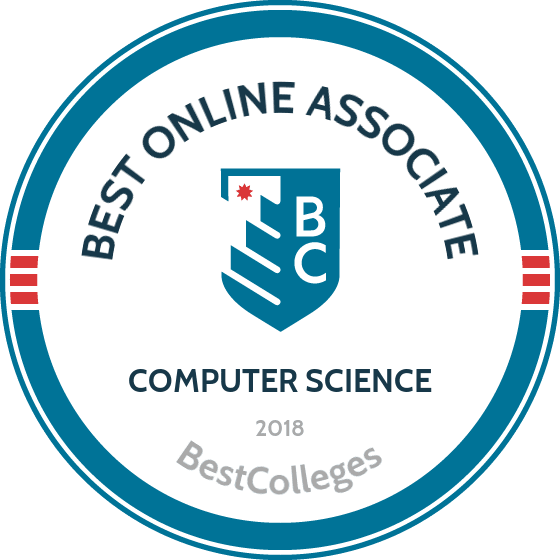 What Are The Best Online Associate in Computer Science Programs? What Will I Learn in an Online Computer Science Program? What Can I Do With an Associate Degree in Computer Science? As a computer scientist, you'll utilize both theoretical and practical approaches to design and use computers and computational systems. Professionals in this field are trained in a combination of research, experimentation, and engineering, which blend to form the basis of so much of our technology-driven society. Computer science careers are among the fastest-growing occupations in the nation, providing even entry-level job-seekers with a wealth of opportunities. Professionals with computer jobs earn an average of $82,860 a year and can expect to see 12% growth in employment by the year 2024. Pursuing an online computer science associate degree is the first step toward beginning your career in this diverse and exciting field. Founded in 1964 and located in Newtown, Pennsylvania, Bucks County Community College offers an online computer science associate degree. Distance learners in this program focus on calculus-level mathematics, program analysis, coding, and system testing. In addition to learning about common business practices, BCCC graduates also become proficient in developing algorithms and managing large collections of data. Additionally, BCCC's program is analogous to the first two years offered at many four-year schools, allowing interested students to easily transfer and pursue a bachelor’s degree. Over the course of four semesters, students complete a total of 62 credits in order to graduate. Depending on your placement test results, some students may require more than four semesters to complete major requirements. During the first three semesters, all enrollees of this program have nearly identical course loads, taking series of incremental classes (e.g., computer science levels one, two, and three) each semester. In the final semester, students customize their education by completing elective courses while working on data design and application development. Founded in 1970, Lord Fairfax Community College offers more than 75 associate degree and certificate programs. LFCC’s associate degree in computer science can be completed online and is designed for individuals who plan on transferring to a four-year institution. The school ensures that coursework in English, physical education, humanities, mathematics, science, and social sciences is transferrable to most universities or colleges. To help students move on to four-year schools, LFCC offers a transfer credit guide with important information regarding GPAs, tuition, and application requirements for dozens of colleges and universities. Distance learners can complete this associate degree in four semesters. During the first three semesters, students complete entry-level geometry, writing, and introduction to computer sciences courses. By the end of their third semester, students at LFCC earn a certificate in general education. Graduates are prepared to pursue their bachelor's degree and then work as software developers or systems engineers. Located in The Woodlands, Texas and founded in 1973, Lone Star College System offers associate degrees and workforce certificates that can be easily transferred to other institutions. Among these offering is LSC’s two-year associate degree in computer science online program. Students interested in pursuing this degree may have to take prerequisite courses in college algebra and trigonometry, depending on their official transcripts and placement exam scores. LSC is an open-enrollment institution, and most students are accepted. LSC focuses on producing transfer students who are able to find success at four-year institutions. Distance learners receive degree planning guidance from departmental advisors and follow a "2+2" pathway: two years at LSC and two years at another institution to complete a baccalaureate degree. Full-time students can expect to complete their degree in two years or less. Founded in 1993, South Texas College boasts an online education department that offers 32 degrees that can be completed entirely online without any on-campus obligations. Its online computer science associate degree is a two-year program that prepares students to continue their education in computer software engineering or computer science. Graduates may also pursue entry-level positions in the field of computer science, such as software engineers and information security analysts. In this 62-credit program, distance learners take 18 credit hours of major-specific courses, including programming fundamentals and computer organization. The core curriculum consists of 42 credit hours in English composition, mathematics, life and physical sciences, history, and physical science. The remaining credit hours are allocated to elective courses. In total, students can expect to complete their degree requirements over the course of five semesters. Founded in 1875, Park University in Parkville, Missouri offers an online associate of science in information and computer science degree. Degree candidates can choose one or more specialties from a range of topics, including computer science, software engineering, data management, and networking. Graduates are prepared to work as IT managers, database analysts, program managers, and network analysts. Distance learners enrolled in this 60-credit program must demonstrate proficiency in the English language and mathematics by successfully completing prerequisite courses or passing placement exams. The 29- to 30-credit core curriculum includes classes in statistics and information management. Possible electives include pre-calculus and financial accounting. Students also complete 15 credits of liberal arts education requirements. Financial aid is available in the form of military family scholarships, need-based assistance, and degree-specific awards. Northwest Iowa Community College, located in Sheldon, Iowa, was founded in 1966 and offers over 750 online courses. Full-time students pursuing its online computer science associate degree can finish the program in four semesters. Degree candidates at NWICC choose a speciality in programming, networking, or web development. Distance learners engage in hands-on learning and complete group projects, in addition to taking traditional lecture-based classes. Students learn about programming methods, linear algorithms and object orientation, database structures, and networking essentials. In addition to a mathematics-heavy core curriculum, computer science majors also gain a comprehensive understanding of IT fundamentals, networking concepts and operating systems, network security, and user support. NWICC is part of the Iowa Community College Online Consortium; its students can take courses from instructors from numerous other schools across the state while earning credit toward their degree at NWICC. Ocean County College in Toms River, New Jersey is a public two-year community college that was established in 1969. The school offers a variety of online degrees in the sciences and arts. Its associate degree in computer science follows a curriculum model provided by the Association of Computing Machinery and the Institute of Electrical and Electronics Engineers, allowing students to easily transfer credits to four-year institutions. OCC recommends that applicants to this program have a high school diploma, a cumulative GPA of 2.0 or above, and rank in the top 50% of their high school graduating class. Students in OCC’s 62-credit computer science program develop effective problem solving skills and learn to construct algorithms. Required courses for this degree include programming, data analysis, calculus, and physics. Students must also take social science, humanities, and elective courses. Founded in 1889 in Ogden, Utah, Weber State University offers an associate of applied science degree in computer science that can be completed online. New students take a computer science-related advanced placement exam to determine which software development courses they need to take; it is possible to earn up to four free hours of course credit with an optimal placement exam score. Major course requirements for this degree include network fundamentals, software engineering, and computer architecture. Additionally, 18 to 21 credits of supplemental courses, including college writing, physics, calculus, and statistics, are required. Distance learners must also meet a high level of computer literacy by their final semester. This literacy is determined based on four different assessments: document creation, device management competency, data manipulation, and information literacy. In addition to passing these assessments, students must earn an overall GPA of 2.70 or higher to graduate. Trinity Valley Community College in Athens, Texas was founded in 1946 and offers online workforce education programs. TVCC offers online and hybrid courses that focus on preparing students to work in entry-level positions in health services, business, industry, and technical fields. Students in the computer science department choose from concentrations in business or science. The associate of applied science degree at TVCC also helps prepare students to pursue a bachelor's degree after graduating. Distance learners work with a counselor or academic advisor to ensure that they are able to successfully transfer credits to a four-year institution. This 60-credit program can be completed in as few as four semesters. In addition to major-specific courses, the core curriculum at TVCC emphasizes government, history, and English courses. Distance learners may be eligible for work-study positions depending on their availability and location. Established in 1965, Hawaii Pacific University is the largest private university in the Central Pacific. HPU offers an associate degree of computer science online through its Military Campus Programs, which specialize in helping military service members, their families, veterans, U.S. government civilians, and other non-traditional students achieve their educational and professional goals. While completing 60 semester hours of training, students learn a variety of skills, including how to apply problem-solving techniques for algorithms and computer programs, create graphical user interfaces, and demonstrate logic and proof techniques in discrete mathematics. The major-specific curriculum is heavily grounded in mathematics, statistics, biology, and physics. This associate degree is designed to lead directly into HPU’s bachelor’s of science in computer science program, allowing interested students to easily pursue a four-year diploma. Special financial aid programs exist for active military and veteran students. Central Texas College, located in the city of Killeen, offers an online computer science associate degree that allows distance learners to study both computer hardware and software. This program teaches students the foundations of computer science and covers data structures, computer architecture, and object-oriented programming. Students can choose from concentrations in information security, information technology, networks systems administration, or programmer analyst. All concentrations require the completion of 60 credit hours to graduate. Students can expect to earn their degree in two years. The computer science department also offers internship opportunities. Interns generally spend 12-18 hours per week on-site working with a supervisor who returns a performance review to the computer science department at the end of the internship; students are awarded a grade based on this performance review. Established in 1964, Montgomery Community College in Blue Bell, Pennsylvania offers a career-oriented, 60-credit hour associate degree in computer science. This program is also well-suited for students who plan to transfer to a four-year institution to pursue a bachelor's in computer science. Thus, MCCC meets the requirements of the Pennsylvania Department of Education's Transfer Agreement Oversight Committee to ensure that this degree can be easily transferred to other schools in Pennsylvania. Distance learners interested in entering the professional workforce directly after graduation can participate in internships and part-time jobs in addition to developing a job search plan. MCCC offers online resume and job application feedback and meetings with experienced career counselors. The career services office also helps students locate and apply for internships or part-time positions. Panola College, located in Carthage, Texas, offers an associate of science degree in computer science. This two-year program prepares students to enter the professional workforce or pursue further education upon graduation. Courses are offered in a hybrid format or online through the Canvas learning management system. Online classes are are taught synchronously. Distance learners are expected to participate in online activities and message boards and keep up with due dates for assignments. Some Panola teachers require a face-to-face orientation, while others may ask students to take exams on campus. Panola is part of the Virtual College of Texas collaborative program, which gives students the option to choose from hundreds of courses offered by community colleges throughout the state. Distance learners can also obtain professional certifications covering a range of topics, such as Intuit Quickbooks and Adobe CS. Located in Haverhill, Massachusetts, Northern Essex Community College offers an associate degree in computer science and information sciences that can be completed online. This 60-credit hour program specializes in web development and technology & society. Distance learners in this program also receive training in mathematics and the humanities, and can tailor their degree by selecting from a wide range of electives. This degree is typically completed in four semesters or less. Students learn effective verbal and written communication skills, interpersonal skills, and how to conduct technological research, preparing them to fill computer science jobs in both public and private sectors. Past interns and graduates of NECC have secured positions at businesses like UPS, the IRS, and the Commonwealth of Massachusetts. Whether students immediately pursue a professional career or continue their education at a four-year institution, NECC's advising staff helps students with job searches and transferring course credits. Located in New York and founded in 1950, Jamestown Community College offers 11 degree programs and five certificate programs online. Their associate of science in computer science degree requires students to complete a minimum of 60 credit hours over the course of two years. Distance learners without previous college-level math experience must take a mathematics placement exam and may be required to take remedial courses; if this happens, it may take students more than two years to earn their degree. Advanced incoming students should note that some upper level computer science courses may not be offered in the online format. Courses are delivered synchronously and accessible through the Blackboard learning management. Financial aid is available in the form of grants, scholarships, loans, and work-study programs. Ivy Tech Community College, located in Indianapolis, Indiana, offers more than 15 degree programs online, including an associate degree in computer science. This 60-credit program trains distance learners to solve problems related to medical, business, and engineering fields. The major-specific and core curricula offer a diverse set of upper-level courses, allowing students to tailor their degrees to fit their academic and professional goals. Students explore new technologies through three principal categories: software building and design, problem solving, and the improvement of computer performance to better serve our communities. This program is designed for distance learners who are interested in pursuing a bachelor's degree in computer science or information technology; this associate of science degree transfers to all four-year public colleges in the state of Indiana and is equivalent to two years of education. Bristol Community College in Fall River, Massachusetts offers an associate in science in computer information systems transfer degree with a computer science transfer concentration. The department boasts a highly-skilled faculty that works closely with professors of computer science at the University of Massachusetts Dartmouth. This partnership enriches this associate program and allows interested BCC graduates to continue their education at a four-year institution by seamlessly transitioning to UMass. The 73-credit hour curriculum at BCC takes two years to complete and features specializations in object-oriented concepts, programming, and software design. Students also receive instruction in economics, college writing, and mathematics. Degree seekers also complete up to nine elective credits and a combination of biology, chemistry, and physics courses. Online classes are accessible through the Blackboard learning management system. Located in Dryden, New York, Tompkins Cortland Community College is public, two-year college that was founded in 1967; the school is part of the State University of New York (SUNY) system. This online computer science associate degree program is based on recommendations made by the Association of Computing Machinery, which is the oldest organization for professionals and teachers in the computer science field. The curriculum features a strong foundation in mathematics and science. In addition to learning the theoretical background of computer science, degree seekers at TCCC are prepared to enter the workforce or transfer to a four-year institution upon graduation. Graduates are suited to work in entry-level positions in programming, web design, system design, and computer support. Alternatively, distance learners seeking a bachelor's degree can transfer to programs in computer science, computer information systems, and computer engineering. Students must complete 63 credit hours over the course of four semesters to graduate. Located in Birmingham, Alabama and established in 1965, Jefferson State Community College is a two-year school that offers more than 120 university transfer programs and 20 career and certificate programs; among these is an online associate degree in computer science. This flexible program is designed for new students or for working professionals seeking to update their skills. Distance learners earn one of four certificates while working toward their associate degree: microcomputer applications, computer programming, networking, or web technologies. This program is not specifically designed to prepare students for transferring to a four-year institution; instead, JSCC focuses on the skills and knowledge required to succeed in the workplace. Degree candidates must complete a total of 60 semester hours and maintain a minimum cumulative GPA of 2.0 in order to graduate. Entering students my transfer credits toward this degree but at least 25% of the degree coursework must be taken at JSCC. Located in Claremore, Oklahoma, Rogers State University is a public school with over 4,300 enrolled students. RSU's associate degree in computer science is available online and teaches students the skills needed to assume entry-level positions in computer programming. This program is also well-suited for distance learners who wish to pursue a baccalaureate degree in computer science, computer information systems, or information technology. While transferring to a four-year institution other than RSU is an option, the specialty courses in this program are designed to satisfy the requirements for the bachelor's of technology degree offered at RSU. This program requires students to complete at least 65 credit hours in order to graduate. Financial assistance is available in the form of grants, loans, federal work study, and veterans educational benefits. Additionally, all incoming students may apply for RSU's OKpromise assistance program, which covers the cost of tuition and fees and includes an annual stipend. Iowa Western Community College, located just east of Omaha, was founded in 1966. Students pursuing an associate in arts in computer science at IWCC choose from four concentrations: application programming, computer networking, web programming, and eCommerce. This program can be completed entirely online or through hybrid courses where students attend some classes at one of IWCC's five campus locations. This program specializes in preparing students to work in a variety of information technology fields. Previous graduates have secured jobs as web developers, software programmers, and network administrators. Alternatively, many students also use this degree as a stepping stone towards a bachelor's degree. This 64-credit program can be completed in is few as four semesters by full-time students. Distance learners are eligible to apply for IWCC’s internal need- and merit-based scholarships. Located in Stone Ridge, New York, Ulster County Community College is a public, two-year school that belongs to the State University of New York system of public institutions. This online associate of science in computer degree can be completed in as few as four semesters by full-time students. The program provides a strong programming and theoretical background, preparing students to enter the workplace or pursue further study at a four-year institution. Distance learners prepare lab assignments, complete individual and group projects, and submit written and oral reports to develop their technical, business, and critical thinking skills. The core computer science courses consist of a Java sequence, preparing graduates to become Java programmers. New students must have a high school diploma or the equivalent and demonstrate sufficient knowledge of college-level mathematics. Distance learners who do not meet the basic reading and math requirements can obtain help through UCCC's writing centers and tutoring programs. Finger Lakes Community College, in Hopewell, New York, is affiliated with the State University of New York system of public institution. The associate degree in computer science at FLCC, which can be completed online, features specializations in mobile application development, object-oriented programming and design, multimedia development, and networking technologies. Graduates can smoothly transition into the information technology workforce or transfer to a four-year private or public university. Recent alumni of this program have found employment at ExxonMobil, Thompson Health, national banks, and investment companies. Distance learners typically spend at least four semesters completing this 64-credit hour degree. Incoming students may be eligible for internal financial assistance reserved for computer science majors. Other sources of financial aid are available internally and externally in the form of loans, grants, and work-study programs. Established in 1879 and located in the city of Milledgeville, Georgia Military College offers 20 online degrees including an associate of science degree in computer science. The curriculum of this program explores basic programming and web design skills in addition to more advanced concepts such as object-oriented Java programming and data structure algorithms. GMC readies students for both entry-level positions in the workforce as well as bachelor's degree programs in computer science and information technology. This 65-credit hour associate degree takes full-time students two years to complete. Learners can take all of their required courses online or in a hybrid format. Additionally, all distance learners pay in-state tuition, regardless of their state of residency. Financial assistance is available through internal scholarships, some of which are reserved for military personnel. Applicants need only submit an official transcript from an accredited high school or their GED. Established in 1902, Franklin University is a private, nonprofit university in Columbus, Ohio. The school offers an associate of science degree in computer science that can be completed online. This program emphasizes strong foundational programming skills and object-oriented software construction. Franklin also offers a variety of elective courses, including mobile programming for mobile devices and smartphones and user experience studies. This degree requires students to complete 64 credits to graduate and involves no on-campus obligations. Students can add a minor in web development or information systems to further specialize their degree. All distance learners must pass entry-level courses in college writing, learning strategies, and communication prior to enrolling in major-specific curriculum. Degree candidates must also meet Franklin's algebra competency requirement. Financial assistance is available in the form of grants, loans, and internal and external scholarships. Each school that offers an associate degree in computer science has its own curriculum, although associate-level coursework typically covers broad topics that are designed to prepare graduates for entry-level employment or to pursue a bachelor's degree. Generally, computer science associate degree courses provide an introduction to programming languages, tech applications, and other multimedia tools. Below are a few of the most common courses that students take while pursuing an online computer science associate degree. Introduction to Computer Applications: In this course, students learn the basics of folder and file navigation and manipulation. They also gain a broad overview of office productivity, word-processing, and presentation skills. Computer Networks: Computer networks courses are designed to introduce students to common types of networking technologies, including local area networks (LANs), wide area networks (WANs), protocols, topologies, transmission media, security, and the internet protocol suite (TCP-IP). Programming Essentials: This course emphasizes programming fundamentals and problem-solving/logical reasoning skills by introducing students to structure logic, data, and diagramming and charting methods. Earning an online computer science associate degree can prepare students for numerous entry-level jobs in the fields of computers and information technology. While some employers prefer a bachelor's degree, candidates with an associate degree in computer science typically meet minimum requirements for many web development, support, and programming careers. The industry also offers hundreds of other employment opportunities for candidates with advanced education and experience. In addition to possessing core computer science knowledge, job-seekers should also be creative, detail-oriented, and have excellent customer service skills. Below are some of the most common careers available to students who have earned their associate degree in computer science online. Support specialists are responsible for helping individuals and organizations resolve computer issues and use computer software and equipment. They may serve fellow IT professionals or assist non-IT employees within their organization. The role of a computer programmer is to write and test code to ensure proper functionality of applications and software. They translate programs written by software developers and engineers into a language that computers understand. While many employers in computer and information technology fields accept an associate degree as the minimum requirement for entry-level positions, transferring into a bachelor's program can be highly lucrative if you're interested in earning a higher salary and/or advancing your career into a senior position or more specialized industry. The highest possible average salary for a computer or network security services professional with an associate degree is relatively limited; however, graduates holding a bachelor's degree in computer science or technology can earn between $20,000 and $40,000 more per year. Below, we've listed some of the bachelor's programs a student holding an associate degree in computer science is prepared to pursue. Computer Science: A school may offer a bachelor's in computer science through its technology, business, or liberal arts department. Core coursework generally emphasizes advanced math skills in geometry, calculus, and physics, and graduates are prepared for tech careers in IT, healthcare, finance, and more. Information Systems: A typical bachelor's program in information systems merges computer science and business fundamentals. Coursework incorporates data processing and hosting with computer system design and software publishing. Graduates are qualified for jobs as IT coordinators, managers, and IT personnel managers. Computer Engineering: Computer engineering programs train students to create new hardware and software systems, providing advanced coursework in computer systems architecture and networking. Graduates are prepared to apply their skills in a variety of settings, including network management or design, robotics, and communications. Computer science is a high-profile field that continues to expand into new sectors of technology, offering many networking and career-building opportunities to its workforce through professional organizations. While some students overlook the opportunity to join professional associations, membership is typically affordable and can provide invaluable networking, leadership, and teambuilding benefits. Perks of computer science and technology professional organizations tend to include free webinars and subscriptions to member publications, reduced registration fees for conventions and seminars, and even job placement services. Some of the most prominent national organizations for computer science professionals are listed below. ASIS&T contains information specialists from all fields and industries in its diverse membership, promoting collaboration between computer scientists, engineers, law professionals, and educators to improve societal methods of gathering and delivering information. The organization hosts 56 chapters and 20 special interest groups. ACM is the largest educational and scientific computing society in the world, advocating computing as both a science and a distinguished profession. Members receive several complimentary newsletters and electronic subscriptions. They are also eligible to submit scholarly journal entries and papers to ACM for publishing consideration. In addition to AWC's numerous nationwide chapters, any five independent members can form a new chapter in their local community. Membership is designed to emphasize networking, visibility, education, service, and mentoring opportunities for women in computer science and related industries. The earnings of an individual working in the field of computer science are affected by a number of variables, from education to professional experience to additional certifications. For many graduates with an associate degree in computer science, how they begin their career and how much they earn depends on job availability and resources in their area. Like most fields, online computer science associate degrees prepare students for entry-level employment; individuals who gain additional education and experience have a better opportunity to advance in their careers and earn a more lucrative income. The following table outlines expected salaries for computer systems analysts, system administrators, and computer support specialists at various stages of their careers. When it comes to financing your online computer science associate degree, the process begins with filling out the FAFSA form. This form is a requirement for most applications and is used to determine your eligibility for government-funded programs. Most schools and even some private lenders also look at your FAFSA in order to determine your eligibility for additional funding. With a variety of scholarships, loans, grants, and work-study awards available to students from nearly every demographic and cultural group, computer science students can find numerous opportunities for educational and career program funding that is specific to their field of study.